Cal Crutchlow is out of Sunday's Argentina Grand Prix because of surgery on his injured right hand. The Ducati rider, 28, hopes to be fit to return to action in next month's Spanish Grand Prix. Ducati test rider Michele Pirro stands in for Crutchlow, who said: "I'm sad to let the team down, but I'm not in condition to race." 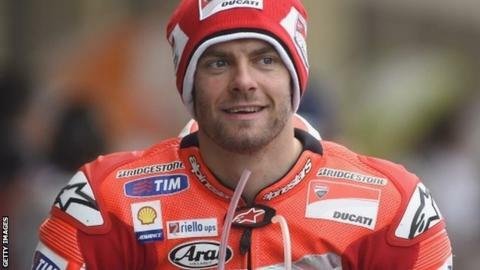 Crutchlow had a stabilising pin put into his hand following a race-ending crash in Austin, Texas, on 13 April. He had hoped to be available to race at the new Autodromo Termas de Rio Hondo, the third race of the season, despite suffering a broken and dislocated finger last weekend. But the former Yamaha rider, who is 11th in the standings behind leader Marc Marquez after two races of the season, has postponed his comeback and returned to the UK to continue treatment. Crutchlow, who is expected return in Jerez on 4 May, admitted: "I'm still feeling too much pain in my hand at present." The Termas de Rio Hondo sees MotoGP return to Argentina for the first time since 1999, when the 500cc race at the Autodromo Oscar A Galvez in Buenos Aires was won by American Kenny Roberts Jr.
Read more on MotoGP: Bikes, rules and riders - What's new for 2014?